OFSS Bihar Merit List 2018: The Bihar School Examination Board (BSEB), Patna is going to released 1st Merit List at ofssbihar.in. 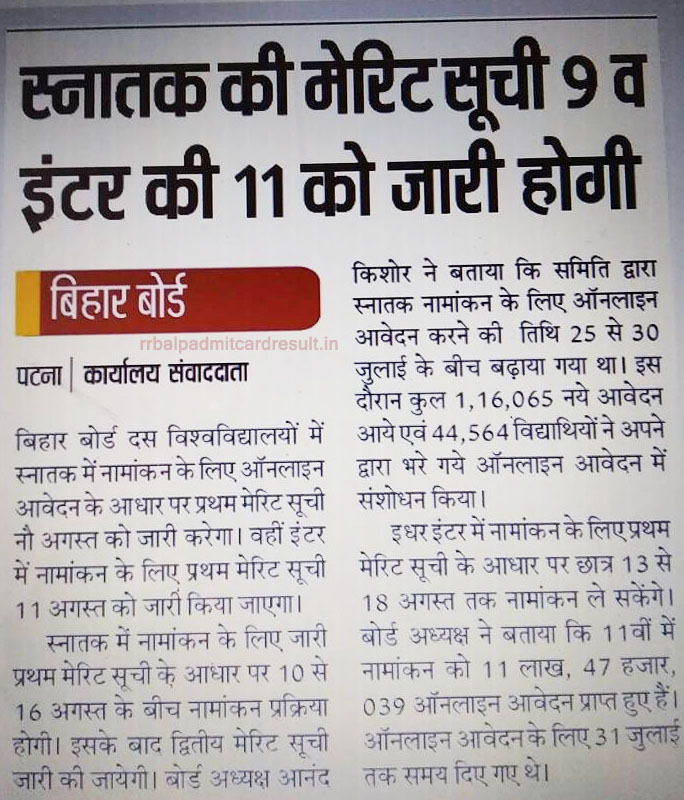 Bihar Board Inter Merit List 2018 will be available on 11th August 2018. The students who have applied for the admission in Under Graduate (U.G.) - BA, B.Sc, B.Com or other courses can check Bihar School Examination Board (BSEB) Merit list on 9th August 2018 at OFSS Bihar website; ofssbihar.in. Read more details about OFSS Bihar Merit List 2018 as mentioned below. The Merit list is to be announced on the basis of students' marks obtained in Intermediate or Matric Examination 2018. 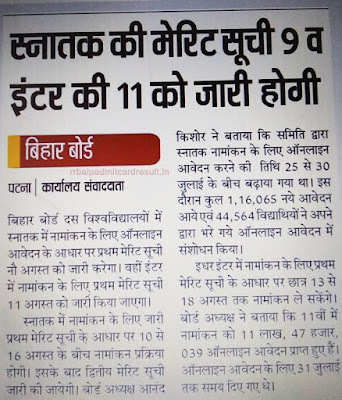 Name and List of College / University will be shown through OFSS Bihar Merit List. To check or download the merit list of Class 11th, one should visit the official website of Online Facilitation System for Students (OFSS). Students who have registered online for the admission either class 11th (I.A, I.Sc, I.Com) for the session 2018-2020 or UG courses (BA, BSc, B.Com) can check their name in the OFSS Bihar merit list 2018 for the purpose of admission. BSEB Patna has organized the online facility for Admission in Intermediate (Class 11th) and Higher Education (B.A, B.Sc, B.Com) Courses. The online application was applied for the passed out students of class 10th / Matric & Intermediate (class 12th) in the year 2018. All students who wish to get admission for Higher Education or Intermediate examination was applied between the online registration date; 30-06-2018 and 12-07-2018 from ofssbihar.in. Now, they all are waiting for the OFSS Bihar student login. After one month, the Bihar School Examination Board is going to release the Merit list for both students. The merit list of Bihar Board Intermediate Admission will be available at online.ofssbihar.in. BSEB Inter merit list 2018 can be checked by using your registration details. In the merit list, the name of colleges / Name of University along with its address will be given. Students need to download BSEB Intermediate (Class 11th) admission merit list 2018 and check their college name and get admission accordingly. The Bihar School Examination Board Online Admissions to Graduation/ Degree courses for the session 2018 – 19 via OFSS is expected to released 1st merit list on 11th August 2018. The 2nd Merit list for the admission in BA, B.Sc, B.Com etc. is likely to be available after 15th August 2018. Students can the candidates need to download the Intimation letter by visiting the official website of Online Facilitation System for Students (OFSS). Click on "Allotment Letter Download" [the link will be available after its announcement]. Now, you can search your merit list using registration number to know the name of your school or college where you can get admission. Students can view or download the Bihar Board Inter / Graduate Merit List 2018 for Admission from OFSS website.